319 Bragg, a brand new off-campus student housing community targeting Auburn University students, needed to create buzz surrounding their new urban style apartment concept in order to establish an impressive amount of brand awareness and create engagement with the Auburn student body. Serendipit was faced with the challenge of launching social media campaigns that were based on the market's demographic and interests in order to convert social media followers into leads and potential new residents at 319 Bragg. The 319 Bragg social media strategy consisted of out-of-the-box contests which included the following: Mustache "Movember" photo contest, Ugly Holiday Sweater photo contest, Dream Destination travel voucher contest and a For the Love of Pugs photo contest. In addition, supplemental visuals were incorporated into the content strategy such as, engaging branded graphics, photos taken around the 319 Bragg leasing center and current events relevant to the Auburn students. 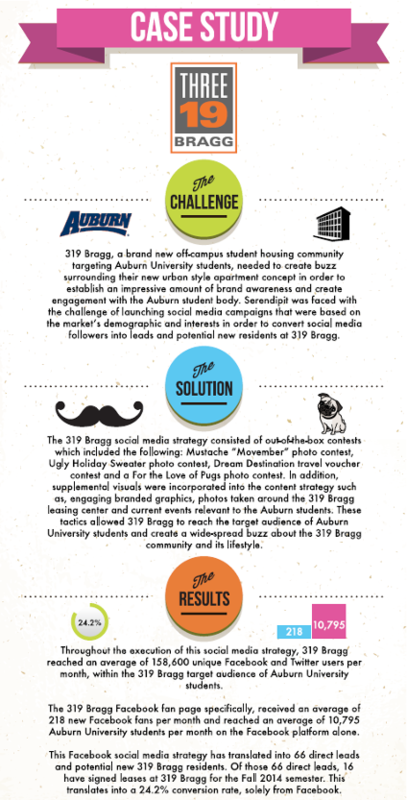 These tactics allowed 319 Bragg to reach the target audience of Auburn University students and create a wide-spread buzz about the 319 Bragg community and its lifestyle. The 319 Bragg Facebook fan page specifically, received an average of 218 new Facebook fans per month and reached an average of 10,795 Auburn University students per month on the Facebook platform alone. This Facebook social media strategy has translated into 66 direct leads and potential new 319 Bragg residents. Of those 66 direct leads, 16 have signed leases at 319 Bragg for the Fall 2014 semester. This translates into a 24.2% conversion rate, solely from Facebook.